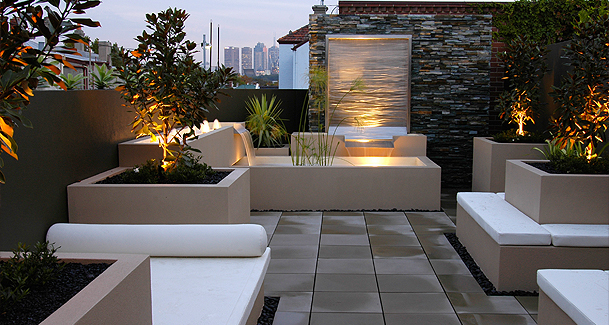 The clients dream brief was to redesign the rooftop into a contemporary useable garden area. Privacy of the area, the screening out of surrounding buildings and the inclusion of modular water features, walls, seating and planter boxes designed to suit the rooftops access were all focal points of the brief. To develop the Carlton rooftop garden we produced a number of scale floor plans and 3D models. Using these tools we were able to visualize how different components and layouts would work in the area. These options were then presented to the client so that they could assess the design and decide on any changes/revisions. Before the manufacturing process commences each component of the modular design is assigned a code. This code follows each individual unit throughout the fabrication stage and is the key to ensuring that each component is manufactured to the correct specifications including dimensions, finish, color etc. The majority of work is completed offsite prior to installation. For this reason all components are designed to suit either stairwell, lift or crane access. We also prep the site and complete any on site works. A quick and simple component installation is then followed by fitting off water features, irrigation/drainage and installing plants. This rooftop garden in the trendy Carlton area was designed with a range of H2O Designs lightweight architectural products that create a beautiful outdoor garden elevated far above ground level. 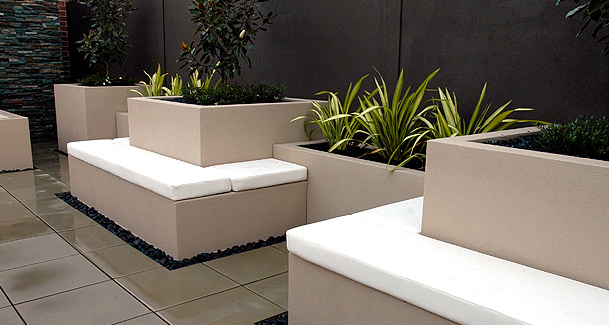 The design features KUBE series lightweight concrete planter boxes, seating, cushions, decorative walls and a focal custom water feature with surrounding cascades and bubblers. All the components are built from LICOM76™ and texture finished.